Ice dams are a pervasive and damaging winter roofing problem typically caused by a combination of a poor attic or roof ventilation and warm attic space. They can also be exacerbated by a clogged or poorly draining gutter system. If ignored, ice dams can cause serious damage to your roof, gutters, paint, insulation and interior drywall and other surfaces. Preventing ice dams usually requires improving ventilation and insulation and removing heat sources from the attic. Ice dams form when the snow melts on an upper, warmer part of a roof. The water then runs down toward the colder eave, where it freezes into ice. As the ice accumulates, it can back up under the roof shingles, where it melts again, soaking the roof sheathing and leaking into the attic. There, it soaks the insulation (rendering it much less effective) and can leak through the ceiling drywall below and into your living space. Also, large ice dams can be very heavy and can damage gutters and even present a safety hazard to people below. So, how does snow melt on your roof when it’s freezing outside? It melts because the underside of the roof in the attic is above 32 degrees Fahrenheit and it warms the outside roof surface to the point that the snow melts. Ironically, ice dams usually start or worsen after a heavy snow because of snow's insulating properties. Ideally, ventilation provides for continuous airflow from the soffit (the underside of the roof eaves) to the peak, or ridge, of the roof. A soffit-and-ridge vent system usually requires insulation baffles installed at the lower side of the roof, above the exterior walls. The baffles hold back the insulation by a couple of inches, creating a channel for air to flow freely past the insulation. Without them, thick insulation can block the air coming in through the soffit vents, eliminating airflow. If a soffit-and-ridge system is not feasible or desirable, ventilation can be provided with soffit or gable vents for intake air and several conventional roof vents for exhaust air. As a general guideline, ventilation systems should provide 1 square foot of net free ventilation per 150 square feet of attic floor space. Net free ventilation is the total area of openings in a vent, minus all screening or other obstructions. In addition to improving attic ventilation, there are several other steps you can take to prevent ice dams. Of course, the best time to win the war against ice dams is before the snow flies in winter. Minimize heat sources in the attic: Proper ventilation alone will not prevent ice dams if you have active heat rejection into the attic. Heat from uninsulated or leaky recessed can lights in the room below add heat to the attic from the light source (light bulb) and allow heated air from the living space to escape into the attic. Other potential heat sources in the attic include uninsulated ductwork and improperly vented bathroom exhaust fans. Increase attic floor insulation: Prevent heat from your living space from warming your attic with proper amounts of insulation in the attic floor. Sealing air leaks in the ceiling is just as—if not more—important than insulation. Keep gutters clean: Get rid off all those fall leaves before the snow comes. Also, make sure your downspouts are functioning properly. Melted snow has nowhere to go if the gutters are clogged. 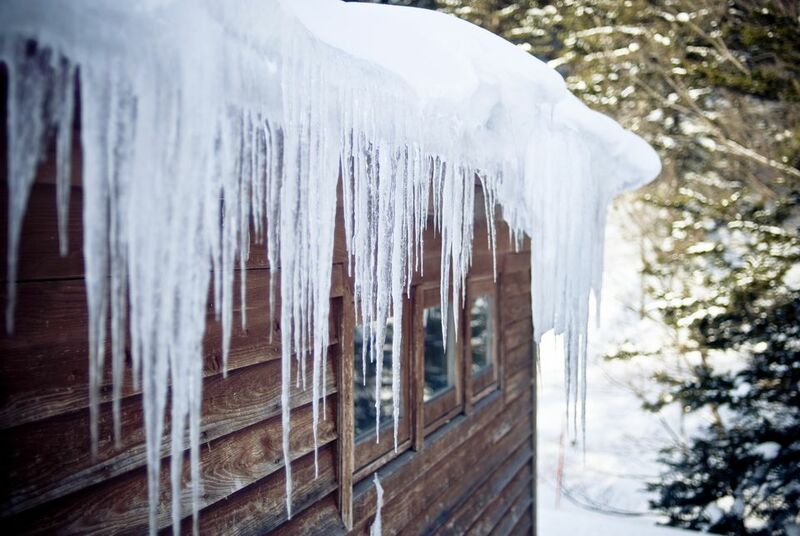 Since ice dams are the furthest things from our minds in the summer, most people battle ice dams in the winter. Unfortunately, your options at this point are limited, at least the safe options. Use a roof rake during heavy snow: As mentioned earlier, ice dams happen quickly after a heavy snow because of the insulating properties of snow. Removing at least the lower 4 feet of snow from the roof edge, using a roof rake, can help prevent ice dams from forming. A roof rake is like a shovel that is turned on its side and has a very long handle, allowing you to pull snow off the roof while on the ground safely. Never get onto a roof to remove snow. Calcium chloride or ice melt product: If you have an ice dam forming, you can apply calcium chloride or similar product to the ice. (Forget any advice you may have heard about putting salt in pantyhose; it does not work well, takes a lot more salt, and results in the pantyhose ripping apart). There may be a time when either the amount of snow or ice dam buildup is too much for you, or you don't have the time or inclination to try to remove the ice dam yourself. The solution then is to call an ice dam removal contractor. There are professional companies that are insured and will remove your ice dam using special equipment, such as a high-temperature/low-pressure steamer, to melt the ice and snow from your roof. Do not hire a contractor that uses a high-pressure power washer with a steam box, which can damage shingles. While this service may cost a few hundred dollars, it can prevent significant damage to your home.